No matter how you feel about the current state of Final Fantasy—and if you're a fan of role-playing games at all, you likely have some sort of unshakeable conviction about which was the best, which was the worst, and how Square Enix has ruined everything—there's one fact you can't deny: It's got some awesome jams. 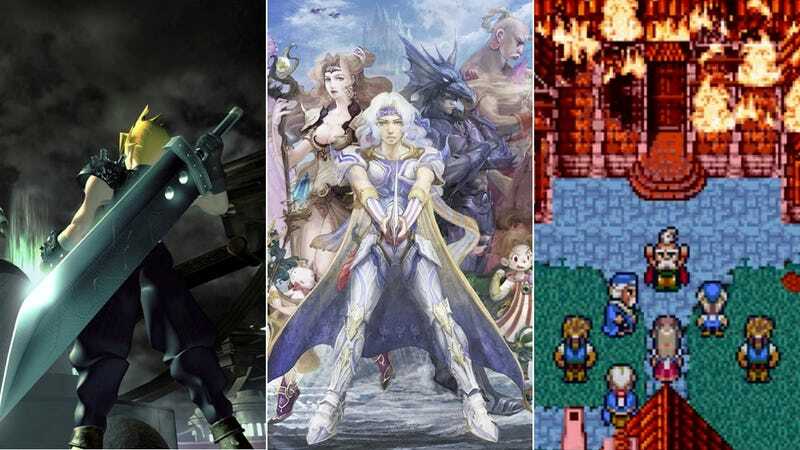 Composer Nobuo Uematsu is the best in the business, and for tonight's edition of Kotaku Melodic I thought I'd pay tribute to ten of his tracks that rank among my favorites. Remember, these are not the ten best Final Fantasy songs. It'd be impossible to pick only ten best tracks out of Uematsu's tremendous body of work. These are just my ten favorite. So keep that in mind before you get angry and post in the comments about how I left out your favorite song. Thanks in advance. Final Fantasy IV's regal airship theme is an eternally hummable, lovely theme that does a wonderful job of both introducing the game and making you feel like you're being accompanied by a marching band. It's treasure hunter, bro. I want this theme to play whenever I enter a room. The only real downside of this rocking violin-heavy track is that it takes a solid 58 seconds to get to the good part. Final Fantasy XIII's fast-paced battles are often over by then. Fun fact: the bulk of this track is actually a slow-paced variation on Aria di Mezzo Carattere, also known as the Opera Song. I like this version better because it always remind me of that one scene halfway through Final Fantasy VI where Celes... well, Kirk hasn't played the game yet, so I won't spoil it. You know the scene. Aerith's (Aeris's) Theme is also a variation on Aria di Mezzo Carattere. It's also known as the song that will make you cry forever. You could use this track to hype yourself up before an important job interview or first date. Just listen to that bass. Heart-pumping. There's a funny dissonance between this song—one of the grandest things I've heard, the type of melody you might play to introduce a king—and the character it represents. Final Fantasy VII's Cid is a gruff engineer who likes to curse a lot. Still, it's a great track. This lovely track never comes up when people bring up the best Final Fantasy music, but it should. It's gorgeous. If this song doesn't make you want to go on an adventure, you have no soul. Aw. This makes me sad for Setzer. Poor Setzer.